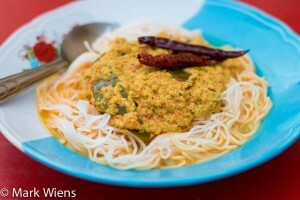 One of the most loved dishes in southern Thailand is khanom jeen nam ya (ขนมจีนน้ำยา), a coconut milk minced fish curry. I’ve eaten khanom jeen nam ya (ขนมจีนน้ำยา) at many restaurants and street food stalls in the south of Thailand, but I still haven’t found a version better than my mother in-law’s. Formerly, she sold this dish from a street food cart and out of her home for many years in the southern Thai town of Krabi. My mother in-law makes a lot of amazing Thai food and all sorts of recipes are stored in her head, but if there’s one dish she makes the best, it would be khanom jeen nam ya (ขนมจีนน้ำยา). If you use fresh fish, the right amount of spices and ingredients (as listed below), and fresh buttery coconut milk, I guarantee this fish curry with blow your mind with how delicious it is. Are you ready to make this amazing mother in-law Thai fish curry recipe? Many curries take a long time to cook, and are a very time consuming dish to prepare. That is true for some curries, but for this Thai fish curry recipe, one of the beauties is that it doesn’t have to cook for long. All you have to do is boil the fish on its own, pound the curry paste, then combine everything together with coconut milk, bring to a boil, simmer for just 5 minutes, and you’re done (and ready to eat). This recipe doesn’t take too long to make, and it’s tastes incredible. 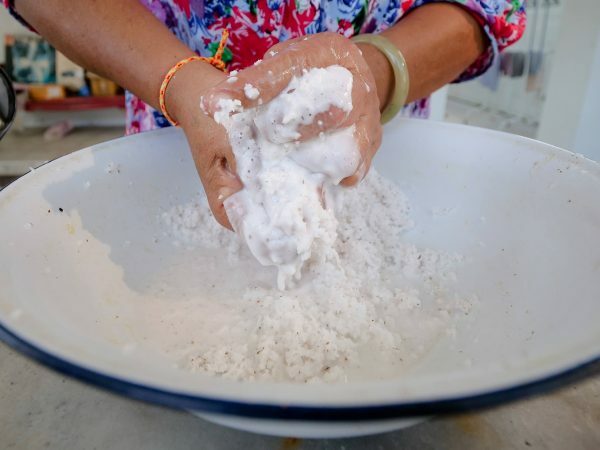 The hardest part about making khanom jeen nam ya (น้ำยา) is pounding the curry paste by hand (or you can blend it alternatively, though it tastes best if you pound it). Note: For coconut milk, if you don’t have access to fresh coconut milk, I think one of the best alternatives is AROY-D 100% Coconut Milk that comes in a carton – to me, this is better than in a can and it’s 100% coconut milk. Read more about coconut milk and how it’s used in Thailand below. NOTE: If you want to get straight to the recipe, scroll down to the video and recipe box below. 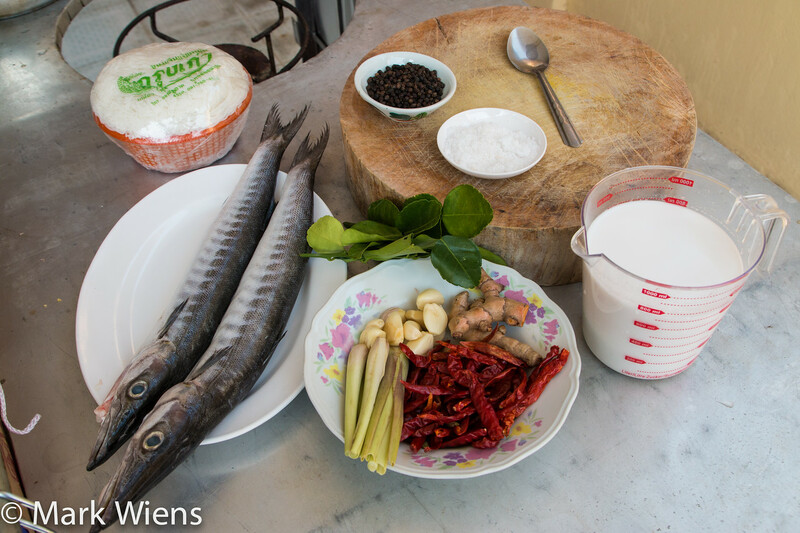 But if you want to get more details about making khanom jeen nam ya (with more photos) keep reading. Since this is Thai fish curry, fish is going to be one of the essential ingredients that we use. I will be using barracuda (yup the ones with the razor sharp teeth), but these are very small barracuda, only about 1/2 kg. each. If you can find barracuda, it’s one of my favorite fish to use in this recipe, but in southern Thailand cooks also use a variety of different fish like mackerel, or skid, or I think any white firm meat fish from the ocean would work alright. In Thailand, barracuda is widely available in the south and up through Bangkok where you’ll find it at nearly all fresh markets. If your fish hasn’t already been gutted, make sure you clean and gut it. The first step is to boil the fish on its own, and this is a very easy step. 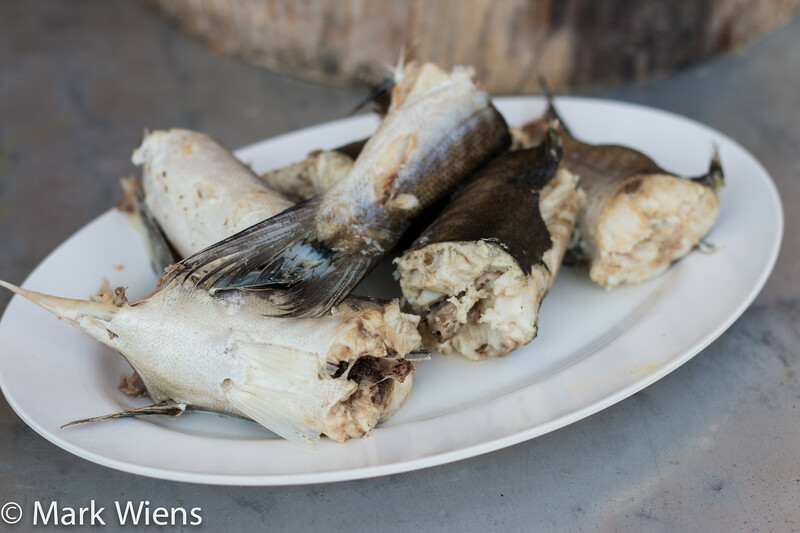 Just cut the fish into pieces so it’s easier to manage, then boil it in a pot of water until it’s fully cooked. It took me about 5 minutes to finish boiling this barracuda, but it depends how thick your fish is. You don’t want to overcook it, but at the same time it’s not very important to cook it perfectly because it’s going to be submerged in curry. Once the fish is finished cooking, remove it from the boiling water, drain, and leave it on a plate to cool. Once the fish has cooled (and you can proceed with the recipe and come back to this if it’s too hot), debone the fish meat, and I usually take off and discard the skin as well. 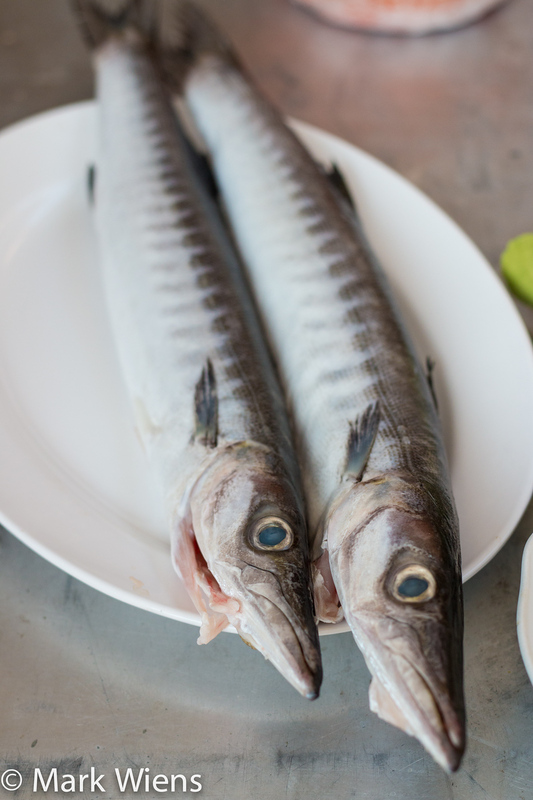 While deboning the barracuda, also break the fish apart with your fingers, so it’s just little flakes of boneless fish – this makes it easier to remove all the bones too. Then set aside the fish for later. One of the things I just can’t get enough of, and love immensely about eating and cooking Thai food are the curry pastes. Hand grinding ingredients, blending the pungent flavors of garlic, shallots, chilies, turmeric, and kaffir lime leaves, and releasing all of their oils for maximum flavor sensation, is something that always makes me excited. 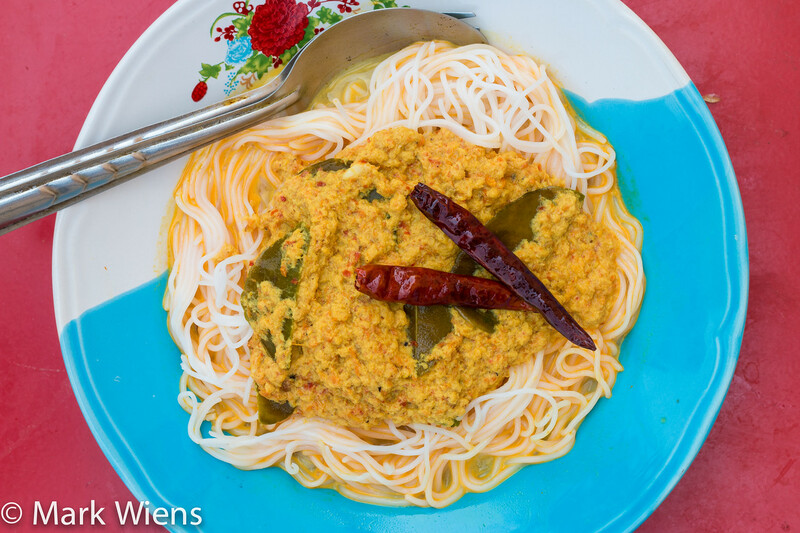 The curry paste for this khanom jeen nam ya recipe (ขนมจีนน้ำยา) is similar to a typical southern Thai curry paste, but it includes a few less ingredients (but if you have southern Thai curry paste prepared already, you could still use it in this recipe). 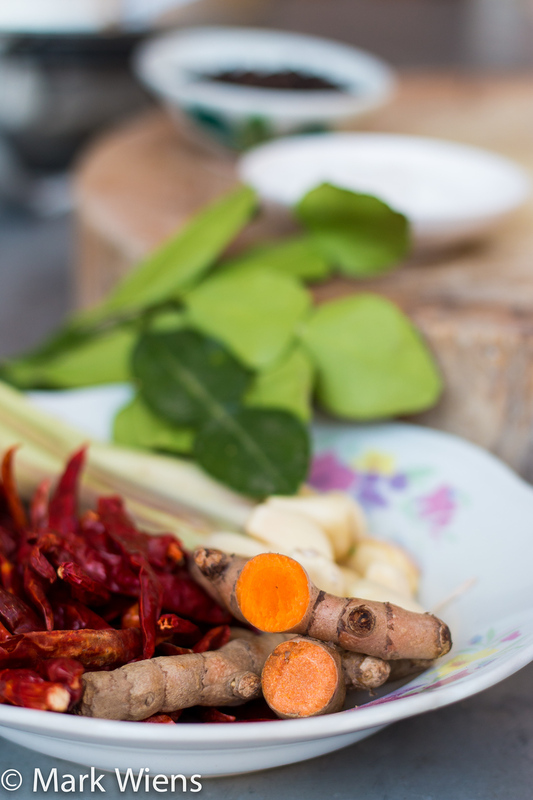 The first step to making the curry paste is to prepare all your ingredients to pound. Peel the garlic, then slice the turmeric into bits. For the lemongrass, cut off and discard the outer couple layers, and toss out the top half of the stem as well (all the lemongrass flavor and oil is in the bottom half of the grass), then shave the lemongrass. I like to first add a pinch of salt to the bottom of my mortar, then add the Thai dry chilies first and pound them for about 5 minutes. The salt adds some moisture and keeps the chilies and seeds from flying out so easily. From there, you can really add in the ingredients as you please (minus the shrimp paste, hold off on that). My strategy is that I typically add ingredients little by little, pounding and pounding, until everything is added. You don’t need the paste to be quite as fine or smooth as for other Thai curry recipes. A little chunky is alright, but make sure all the ingredients are blended and the oils have all been released. It took me about 30 minutes to pound. Warning: You may want to wear gloves when pounding chilies by hand. If you touch them for too long, they will burn, and can burn on your hands for hours. 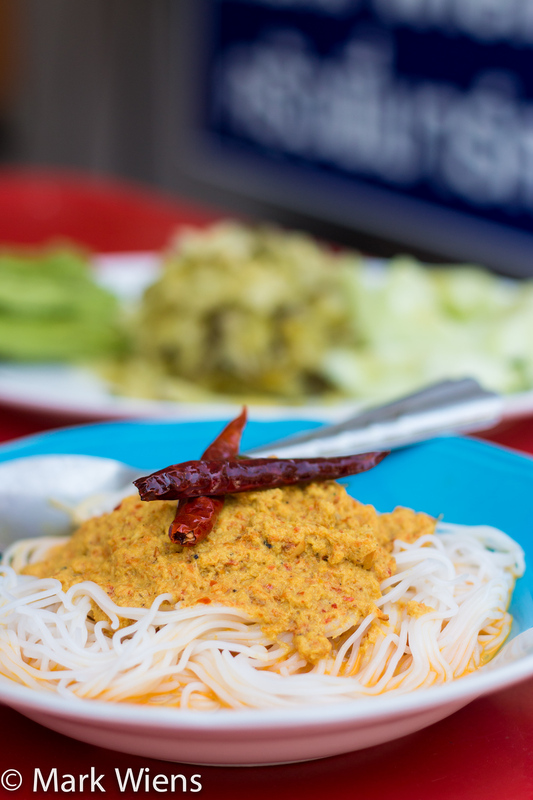 Once you have a nice curry paste, the final step is to add shrimp paste, a necessary ingredients in just about all southern Thai cuisine. Add the shrimp paste to the curry paste, and mix and pound for another couple of minutes until it’s fully mixed through. Your curry paste should look like the curry paste above, bright orange in color from all that beautiful turmeric. But when you combine it with the creamy coconut milk, your curry will transform to a marvelous yellow color. Now we have our deboned fish and our curry paste, all we really need to do now is assemble our curry with the coconut milk. 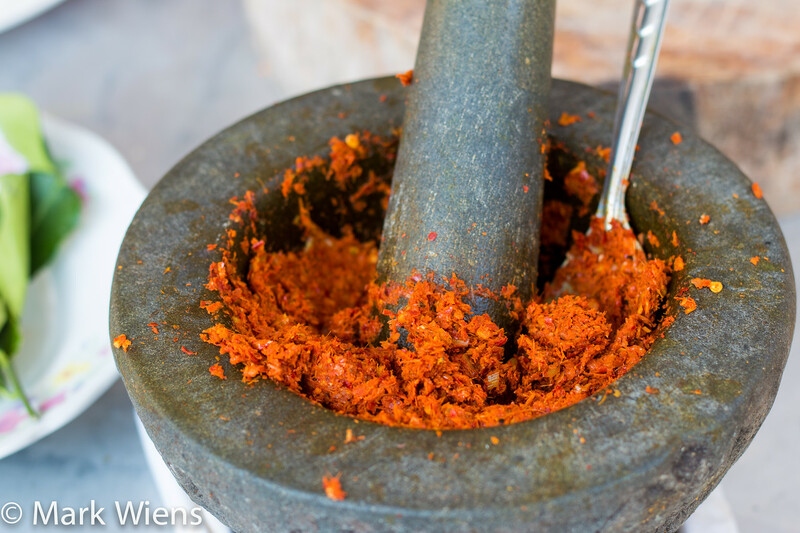 The best way to pound your curry paste is by hand using a stone mortar and pestle , but to save time and effort, throw all the ingredients into a food processor or blender and blend until smooth. Coconuts are amazing – from drinking coconut water, to eating the meat, using coconut oil, and of course, coconut milk – they are useful in so many ways. The great news is, while coconuts used to be considered full of bad fat, the tables have turned with new research and the health benefits of consuming coconuts, and that’s great news for Thai curry lovers! Yes coconuts are fatty, but wow is that some high quality and delicious fat. If you have access to fresh coconut milk, it will taste multiple times better than canned or boxed coconut milk. I understand if you don’t have access to it, but really, if you can make effort to find fresh coconut milk, this Thai fish curry recipe will blow your mind even more. Hua kati (หัวกะทิ) – This is the real stuff, this is the coconut cream, the thick buttery goodness. For this khanom jeen nam ya recipe (ขนมจีนน้ำยา) we’re going to be using both the hua kati and han kati. What if you don’t have fresh coconut milk? If you don’t access to fresh coconut milk to make this recipe, the next best thing in my opinion is AROY-D 100% coconut milk in a carton . I think the taste is better than in the can and it’s also 100% coconut milk. Grab a pot and add all the coconut milk, and turn your burner or stove onto a medium heat. You can then add in all the curry paste and the deboned fish flakes, and begin to gently stir. 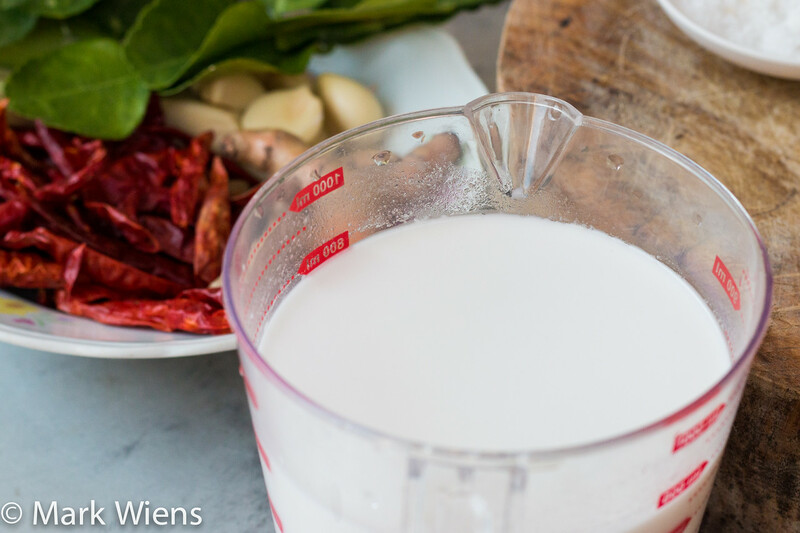 Just like cooking tom kha gai, or anything that contains coconut milk, you need to be very careful and treat the coconut milk very gently and respectfully. To do this, make sure you stir continually but slowly, in only one direction. If you switch directions swirling the coconut milk, it can get shaken up and start to curdle, which isn’t good. So just handle it carefully. You don’t need to cook the curry very long. Just bring all the ingredients to a boil, then simmer for about 5 minutes, and that’s it. 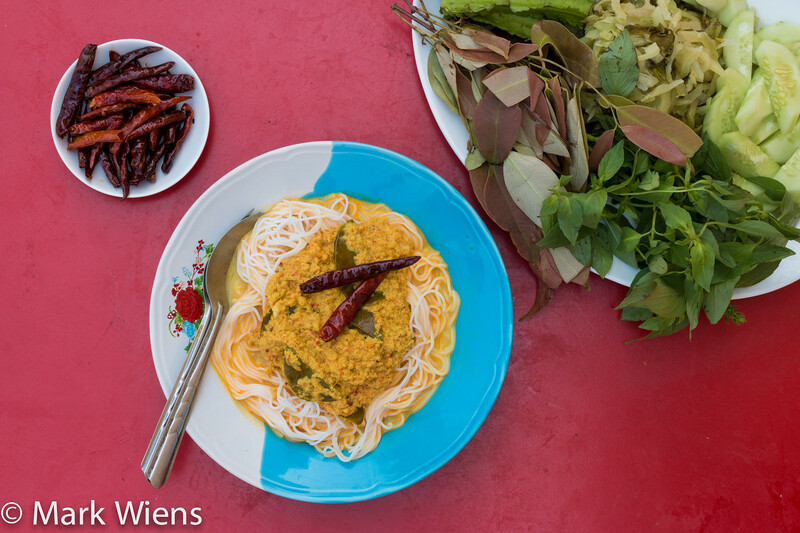 Although this is my mother in-laws nam ya kati recipe, it’s hard to get exact ingredients from her, because she has so much experience, she just tosses things in, taste tests, until it’s perfect – she does barely any thinking. So before you turn off the heat, make sure you taste test. You may need to add a bit more salt. You can eat khanom jeen nam ya (ขนมจีนน้ำยา) with all sorts of herbs and vegetables that you like, but there’s one thing that’s also necessary (in my opinion): crispy fried chilies. To make them, take a handful of Thai dried chilies, and deep fry them in about 1 cm of oil for about 2 – 3 minutes on medium heat. They will start to turn crispy and fragrant. Warning: Be careful frying chilies indoors as you will probably start to cough, open the window or cook outside if possible. 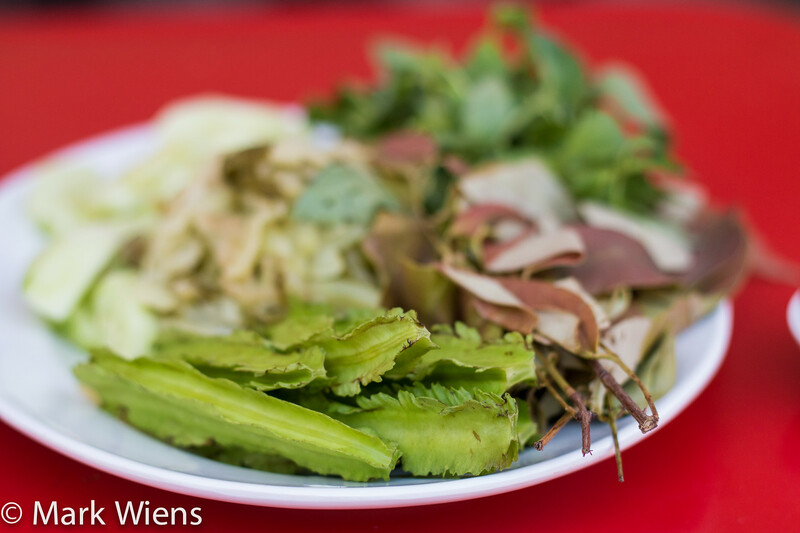 In Thailand you wouldn’t ever be served khanom jeen nam ya (ขนมจีนน้ำยา) without a side plate of raw vegetables to garnish, which in southern Thailand is called pak naw. 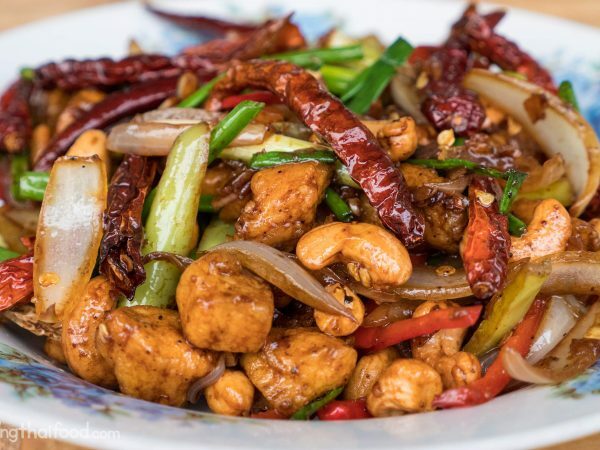 Some of the popular vegetables include Chinese long-beans, cucumbers, pickled mustard greens, pennywort leaves, bean sprouts, and a host of local leaves and herbs like cashew tree leaves. Whatever you can find locally, that will work. 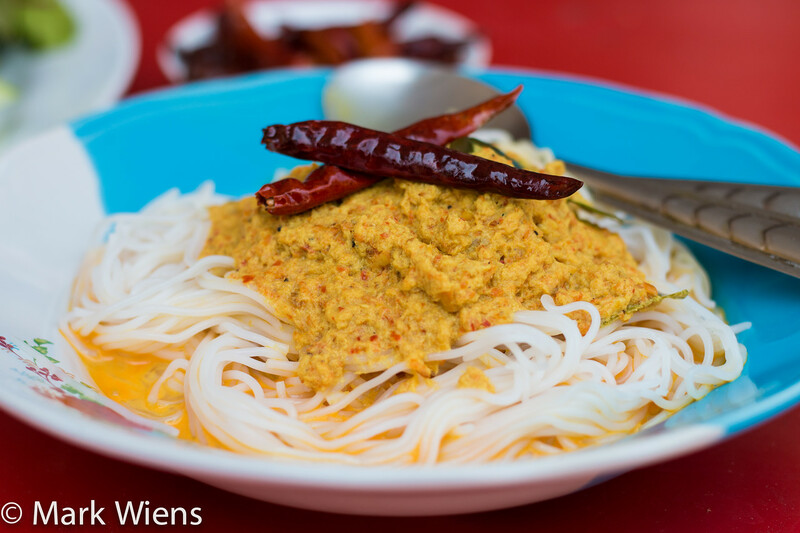 The most common thing to eat this Thai fish curry with is, what in Thai is called khanom jeen (ขนมจีน), which are fresh rice noodles. They are soft and silky, and in Thailand they are sold at markets, already prepared, throughout the country. 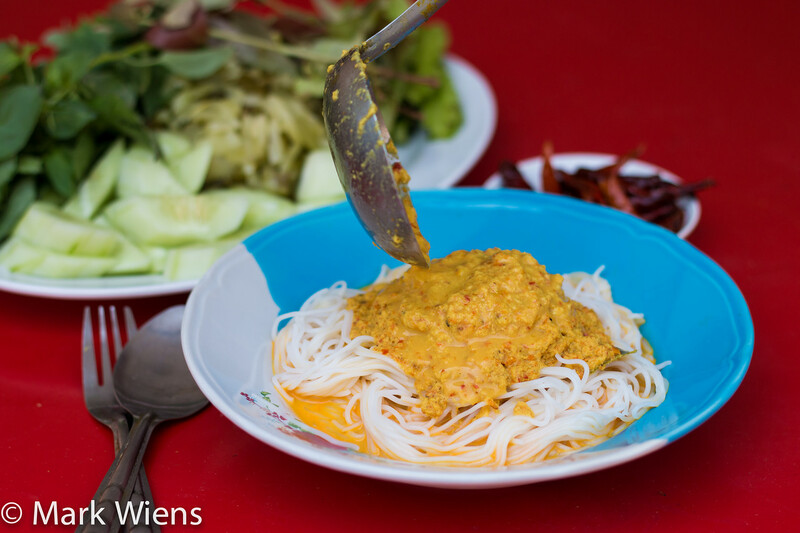 If you can’t get khanom jeen (ขนมจีน) noodles, you could also use any kind of rice vermicelli noodles, or I really like to eat rice instead of noodles altogether. Whatever type of noodles or rice you choose to pair with your fish curry, first add a portion to the bottom of your plate, then spoon on some of the thick succulent curry. 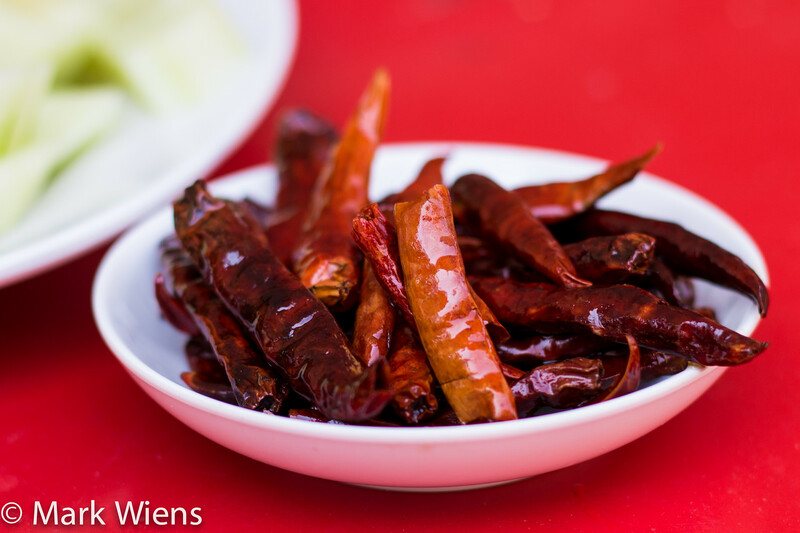 You can then top it with a few fried chilies, and proceed to begin devouring. The curry should be rich and thick from the minced fish, creamy and buttery from the coconut milk, and packed with spice and flavor from the turmeric, lemongrass, and dried chilies. The flavorsome fish curry, paired with the silky soft rice noodles, is a heavenly combination. 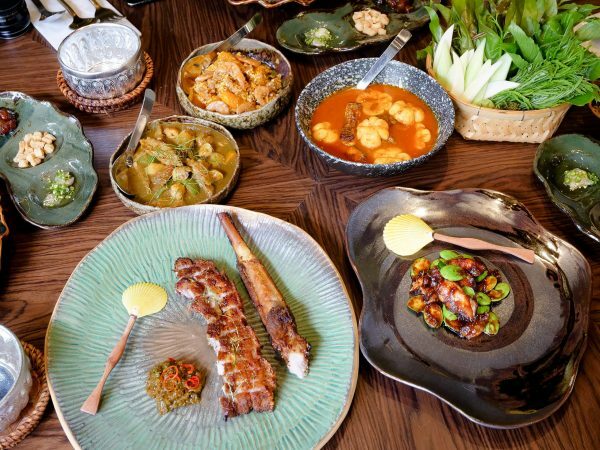 When you take your first bite, you’ll know exactly why it’s one of the most popular and loved southern Thai dishes. You can either take bites of the khanom jeen nam ya (ขนมจีนน้ำยา) and then alternate eating bites of raw vegetables, or you can alternatively grab a handful of vegetables and put them on your plate as you dig in. I like to do a combination of both – but I usually end up throwing on a bunch of the leafy herbs and vegetables onto my curry and eating more of the harder vegetables – like winged beans and cucumber – on the side. There’s no right or wrong way though, whatever works best for you. Can you see that succulent curry in my spoon!? Finally, I just wanted to mention, one of the reason why this khanom jeen nam ya (ขนมจีนน้ำยา) that my mother in-law makes at home is better than anything I’ve ever had is because of the amount of fish. For typical street food in Thailand, in order to keep the price at 25 – 40 THB ($1 – $1.50) per plate, it’s just not possible for vendors to use this much fish. So it’s normally not as thick or hearty as this recipe. So in my opinion, khanom jeen nam ya (ขนมจีนน้ำยา) is best cooked and eaten at home. NOTE: If you don't have fresh coconut milk, instead of using 800 ml, and 1500 ml, just use about 2 liters of coconut milk in a can or box with a little water. My favorite non-fresh coconut milk is AROY-D in a box. Gut and clean the fish, then cut into medium sized pieces. Bring a pot of water to boil, then boil the fish for about 5 - 10 minutes until fully cooked. Remove the fish from the water, drain fully, and leave to cool. Once the fish is cool, carefully take off the skin and debone all the meat from the fish, and flake the fish in your fingers so it's almost like deboned minced fish. Discard the bones and skin. Set aside the fish for later. Cut off the ends of the lemongrass and tear off the outer few layers, then shave the lemongrass into small pieces. Cut the turmeric into small pieces as well. 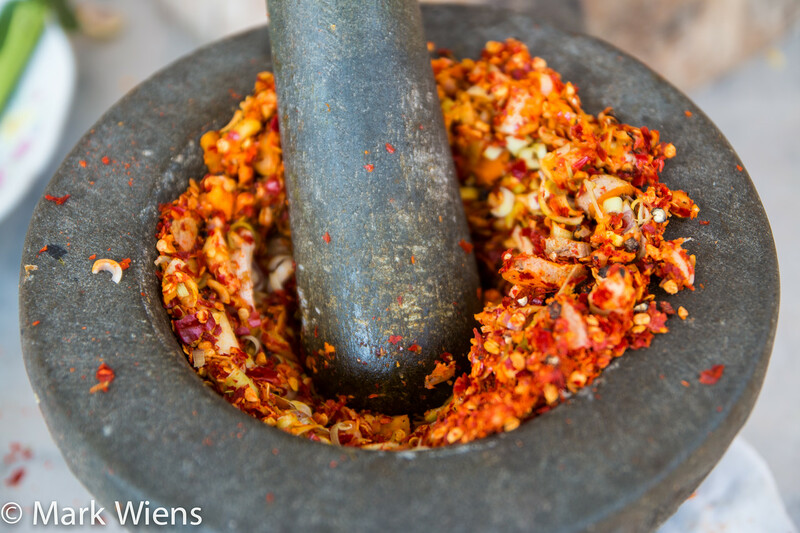 In a mortar and pestle (or alternatively a food processor), start with a pinch of salt, then pound the dry chilies first for about 10 minutes. Then add the lemongrass, turmeric, garlic, and peppercorns, and pound for about 30 minutes until a relatively smooth paste. 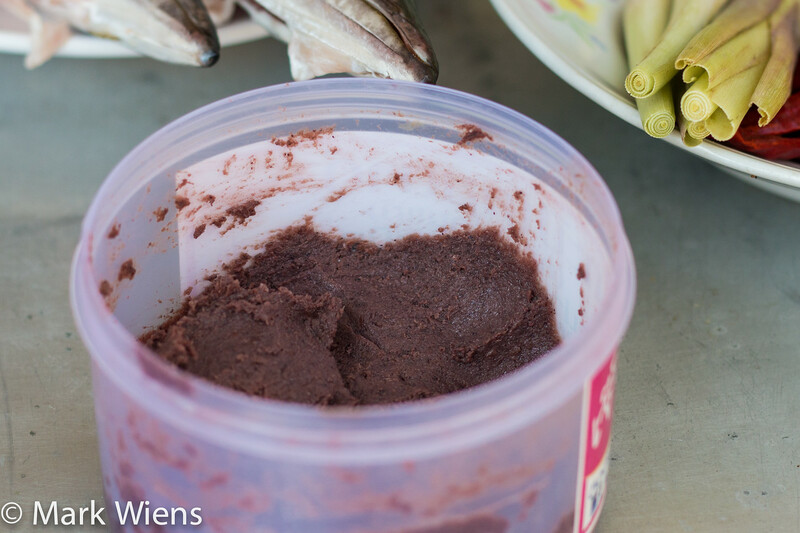 Once the paste is pretty smooth, the final step is to add the shrimp paste, and pound and mix for another 5 minutes. In a large pot or sauce pan, add all the coconut milk and curry paste, then turn on medium heat. Stir gently, and only in one direction, making sure all the curry paste dissolves into the coconut milk. 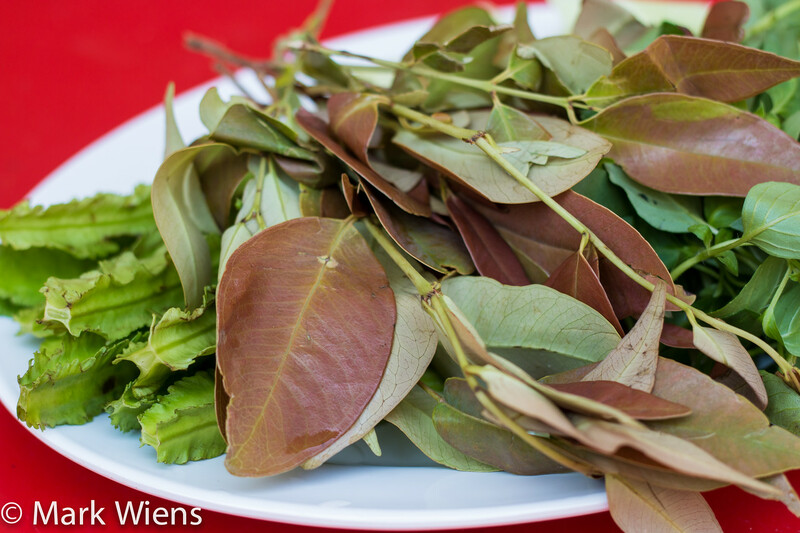 Add the minced fish, season with salt, and tear the kaffir lime leaves in half and add them to the curry. Keep stirring in one direction, and once it comes to a boil, turn down the heat. You don't want the curry to boil strongly. Keep stirring gently for about 5 minutes once it comes to a boil. Taste test for flavor, you may need to add more salt. You're done. 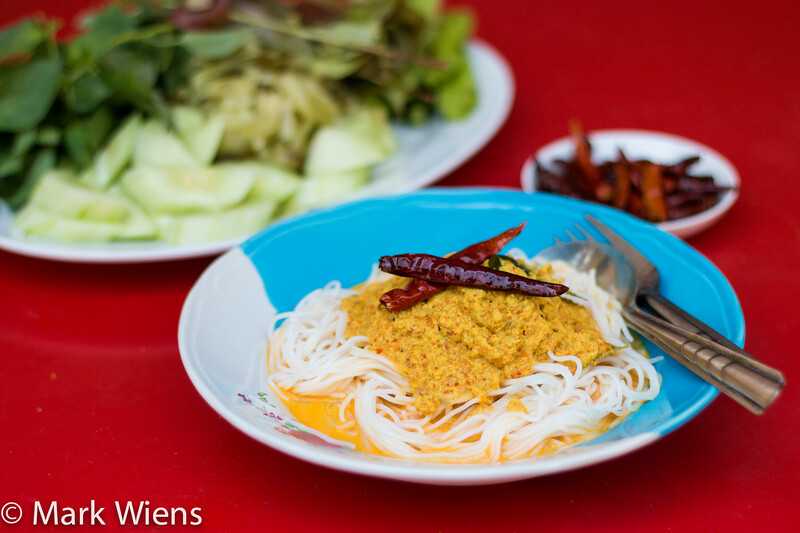 Khanom jeen nam ya (ขนมจีนน้ำยา) is typically eaten along with khanom jeen (ขนมจีน), fresh rice noodles, and garnished with raw vegetables and herbs. Alternatively you can eat it with any kind of noodles or I like to eat it with rice. Click here for more authentic Thai recipe. Get ready for amazing Thai fish curry! Khanom jeen nam ya (ขนมจีนน้ำยา), a curry of minced fish and coconut milk, is one of the most popular dishes in southern Thailand. I’ve tried khanom jeen nam ya (วิธีทำ ขนมจีนน้ำยา) at restaurants and street food stalls throughout Thailand, but so far, nothing has hit my taste buds more deliciously than my mother in-laws own recipe. This Thai fish curry recipe is not difficult to make, and doesn’t take too long, and the combination of ingredients is unbelievably delicious. 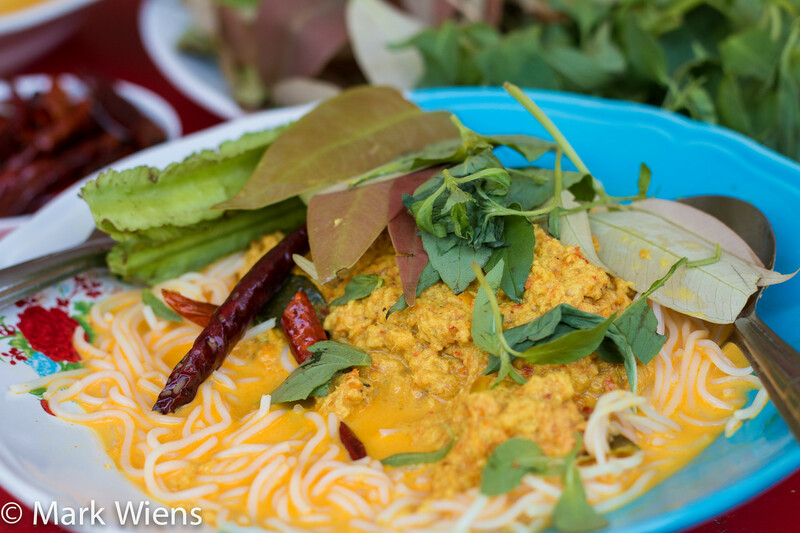 Are you going to make khanom jeen nam ya (วิธีทำ ขนมจีนน้ำยา)? Let me know in the comments below. And if you enjoyed this recipe, I would be grateful if you would share this post on facebook, twitter, or send it to a friend by e-mail. Thank you in advance! Very easy recipe. Love the detailed instructions. I used a food processor but it still came out really well. What kind of shrimp paste would you recommend? You say leaves are eaten with this dish. But you should mention that only young leaves or leaf shoots are used. Hi Mark, I made this dish several times and absolutely love it. Now I want to make it for a dinner party but just learned that one of the guests cannot eat garlic. Do you think it is possible to skip garlic here? Hi there! My husband and I just moved to Bangkok (off Sukhumvit 77) from the United States. Not only was this recipe our first attempt at Thai cooking but also our first attempt at market shopping. Thanks so much for all your advice and passion! Thanks for sharing you receipe. I cooked today. My dad and mom are very like. 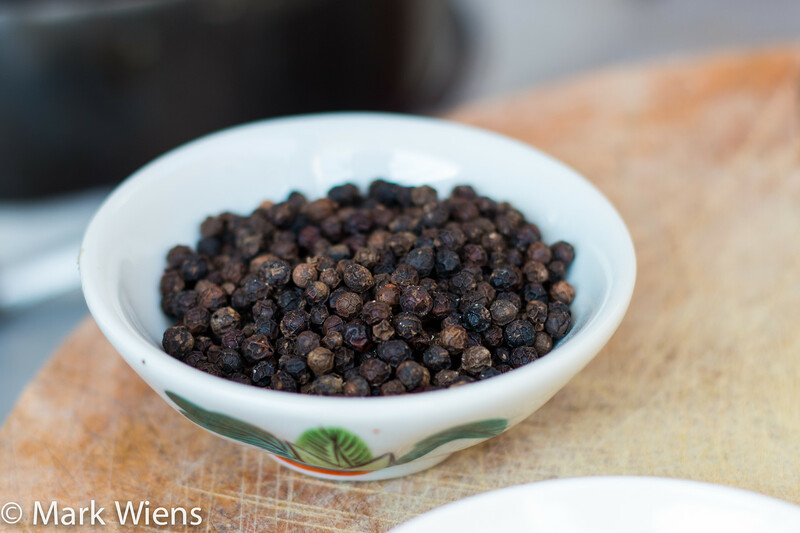 So excited about this recipe I’ve been trying to find it for years since I lived in Bangkok and used to eat it on the roadside, completely unaware of its Thai name, or always forgetting and pronouncing the tone wrong! I am wandering how to make coconut milk myself out of thai fresh young coconuts that I can get in London, do I just blend the coconut meat with water? Any Tips? Thank so much for sharing your great recipes! Thanks a lot for sharing this recipe. 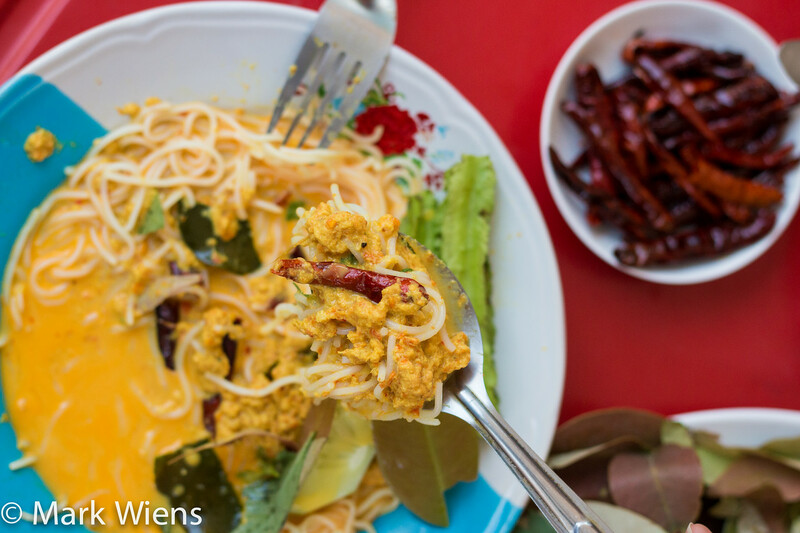 I’ve been looking for the recipe for years as we always call it laksa siam. Now, can’t wait to try it this weekend. Hey Nik, you’re welcome, thank you for reading, hope you enjoy it! This looks like a great recipe, and I’m itching to try it. 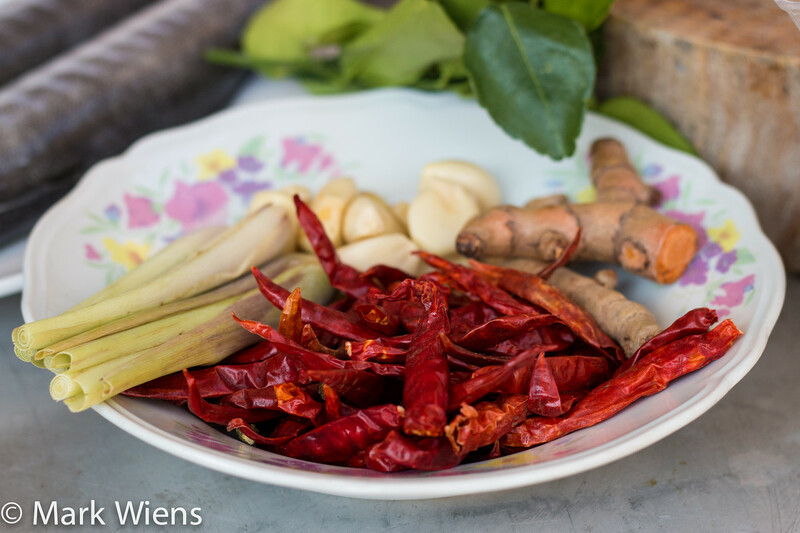 One question though: most Nam Ya recipes I’ve found include krachai (finger root) in the spice paste. I have some krachai in the freezer, and i think it goes well with Thai seafood dishes. Should I add it to this recipe, and if so: how much? Hey Han, great to hear from you, thank you very much. It depends on the recipes and region of Thailand. I know in Chumpon province they often add krachai, but for my mother in law, she usually doesn’t add it. Just a preference, good both ways. Enjoy! Out of curiosity, is it possible to use a food processor instead of a mortar and pestle to make the curry? Hey Jem, yes it is, and that works fine and saves a lot of time and effort. The only downside is that the herbs and spices don’t release their full oil (which is flavor) potential, but it will still be delicious. It looks so yummy. Thank you very much for sharing your homemade recipe. Just one question, no palm sugar in the curry at all? Hi June, you’re welcome. Nope, it relies on the sweetness from the coconut milk. I am so thankful that I found your site Mark. Love the videos and step by step instructions. Love all the curries. We don’t eat pork but I can sub that. Would like egg roll and spring roll instruction as well as dipping sauces and egg roll fish sauce. Love recipes with lots of sweet peppers, onions and pineapple. I filled out the survey but it wouldn’t load so I’m writing this note. Thanks again! Dear Mark, thanks a lot for the great recipe! Hey Ksenija, great to hear you enjoyed this fish curry, thank you for sharing! @Philip – the proper use of dessicated coconut is to soak it in hot (not boiling) water for a few minutes then squeeze the coconut cream out of it. You can do this 2-3 times before the coconut cream/milk is exhausted from the dry coconut. This is what I used to do back in the 70’s in Australia when there was no canned coconut cream available. Surprisingly Woolworth’s Homebrand coconut cream is actually quite good and comes from Thailand! @ Mark – great recipe. So simple. Hi Phi, thank you, and thank you for the added tips. Growing up my mother would make this all the time. I actually grew up thinking that the literal translation of Khanom Jeen was Thai spaghetti (we still call it that in my family). She is well into her years now and this is one recipe that she was unable to pass on to me (and Tod Mun Pla). So thank you for sharing this and I can’t wait to make it myself. I follow you on Twitter but 140 characters not enough to express my gratitude. I was born in Ubon but I grew up in the U.S. so I’m embarrassed to say I don’t speak Thai and I haven’t had the chance yet to go back “home”. So I am truly envious of you. As a foodie myself, I’m doubly envious. 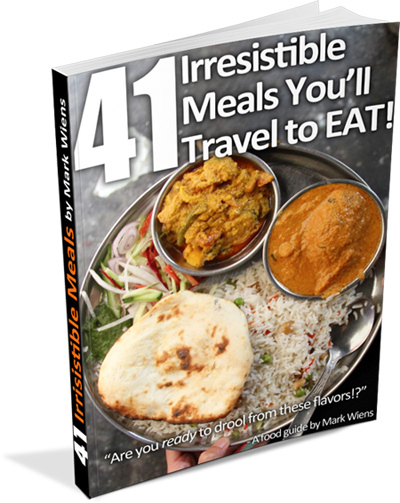 One day soon I will make it to Thailand and I will have your Eating Thai book right by my side. Hi Terry, it’s great to hear from you, thank you for sharing. I hope you can visit Thailand soon in the future! Mark, thank you so much for sharing your recipes! Me and my husband is Thai food lovers. We spend many of our honeymoon time in Bangkok and Krabi (yess, your wife’s hometown!) for Thai food hunting. Your website really gave a great information about this rich culinary. And you know what? I bought a lot of Thai spices and Thai instant foods to cook it in Indonesia based on your recipes ^_^ hope that I will make the food as great as yours! Hi Dwinda, great to hear from you, and congratulations on your honeymoon. Glad you enjoyed the food in Bangkok and Krabi and that you bought some ingredients to bring home. Thank you for your support! Regarding กะทิ, I have been using dried dessicated coconut here in Australia. Say 70g to 700ml of water. Blended up in high speed blender for a few minutes, the mixture gets quite hot. I don’t filter through a rice clothe, just use as is, I think is a good replacement, better than opening up a can. Hey Philip, thank you for your added input, that’s a great tip!